﻿ Book Eco Boutique Hotel Vista Las Islas Reserva Natural (Paquera) - 2019 PRICES FROM $158! 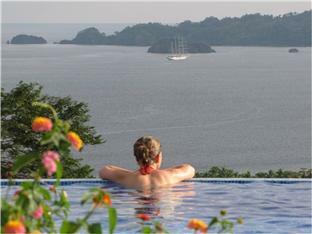 Located on Costa Rica’s Nicoya South Peninsula, Eco Boutique Hotel Vista Las Islas Reserva Natural features an infinity pool, private beach access and spacious accommodations with a balcony. Puntarenas Ferry Port is 5 minutes’ drive away. All elegant bungalows have a ceiling fan and a furnished balcony with views over the Gulf of Nicoya or the surrounding mountains. There is a rain shower in the bathroom. All rooms offer wheelchair access. The hotel restaurant serves both characteristic Costa Rican dishes, including Gallo Pinto and Ceviche, and international food. Guests can enjoy views of the sea or the tropical forest from the restaurant. Staff can provide more information on the wide range of outdoor activities available in the surrounding area, including canoeing, snorkeling or hiking. Please note that the breakfast included is served at the restaurant 164 feet away.